VS = Ventricular Septum What Is It? 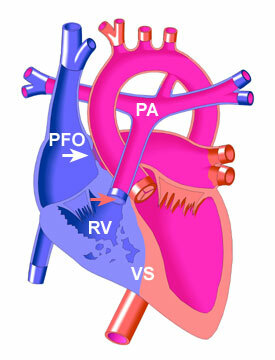 Because the pulmonary valve (red arrow in diagram) does not form during pregnancy, the right ventricle (RV), which normally pumps blood through this valve to the lungs, may not develop normally and remain small (hypoplastic). There are two main types of Pulmonary Atresia, distinguished by whether or not there is also a hole in the muscle wall (ventricular septum (VS)) that separates the right and left ventricles. This hole (not present in the diagram) is known as a Ventricular Septal Defect (VSD). If a Ventricular Septal Defect is present, it may promote growth of the right ventricle during fetal development as the VSD allows the blood flow into the right ventricle to exit the right ventricle through the VSD. If no VSD is present, the tricuspid valve and the right ventricle are quite small (hypolastic). A small hole in the muscle wall between the heart's upper chambers may also be present, known as a Patent Foramen Ovale (PFO). This is actually a feature of the fetal heart, which usually closes soon after birth but may remain open in this disorder. Pulmonary Atresia is a rare defect, occurring with equal frequency in boys and girls, and is related to the congenital heart defect known as Tetralogy of Fallot. It develops during the first 8 weeks of pregnancy from unknown causes.